Every true PC gamer knows what they need to play at the top of their game, from custom-built PCs with liquid cooling systems to gaming peripherals like a gaming mouse and keyboard. With countless accessories all over, it’s hard to find the right one for each player. For me, a keyboard is a keyboard, yet I never really played competitively on PC. 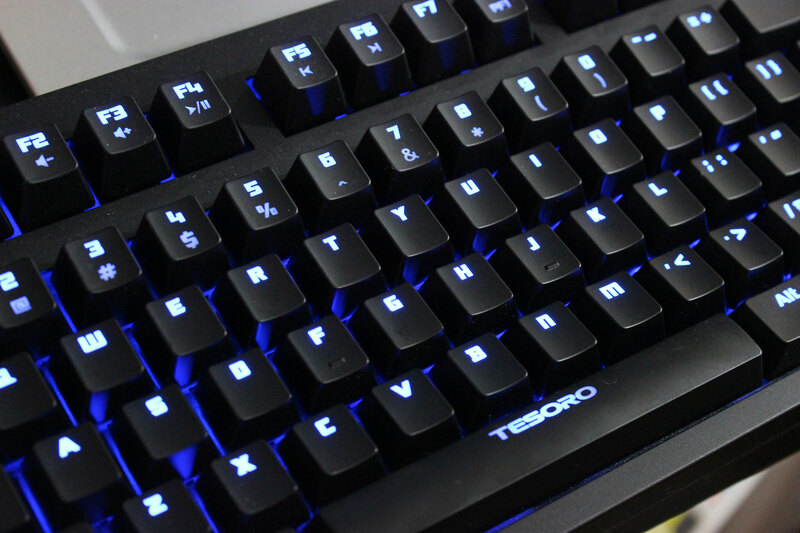 Tesoro, on the other hand, aims to bridge the gap between regular and gaming keyboards with their Excalibur Mechanical Gaming Keyboard. I was given one of these to test out for the past few weeks, from regular use to gaming sessions, and the Excalibur didn’t disappoint. Compatible with Windows XP / Vista / 7 / 8.1. The Excalibur is built with some solid tech underneath. For starters, it has a very sturdy case and each key stroke doesn’t feel flimsy. The keyboard itself has some weight to it, and with the added rubberized pads, it sits snug against any desk without slipping. It has two different modes that can be switched on the fly: N-Key Rollover and USB 6 N-Key Rollover. Coupled with a 1000Hz polling rate, this provides full anti-ghosting and ensures each stoke is registered. As I write this using the Excalibur, typing feels more natural and each keystroke is justified with a click. Within the keyboard lies a 512KB of memory which allows you to store macros and profiles within the keyboard. Tesoro states this to be an advantage since gaming in tournaments prevents the use of outside software. With 5 profiles allowing full programmable buttons, it’s hard not to argue. With that comes the Excalibur software, which allows you to program any key and set macros with each of the profiles. The software itself could have been designed a bit better, seeing how hard it is to read the options, but once set up the keyboard has each profile configured within the keyboard itself. The Excalibur also sports LED lighting with 5 settings. One of the stand out settings is allowing only the WASD, Space Bar, Enter and arrow keys lit up for easy viewing while playing games. 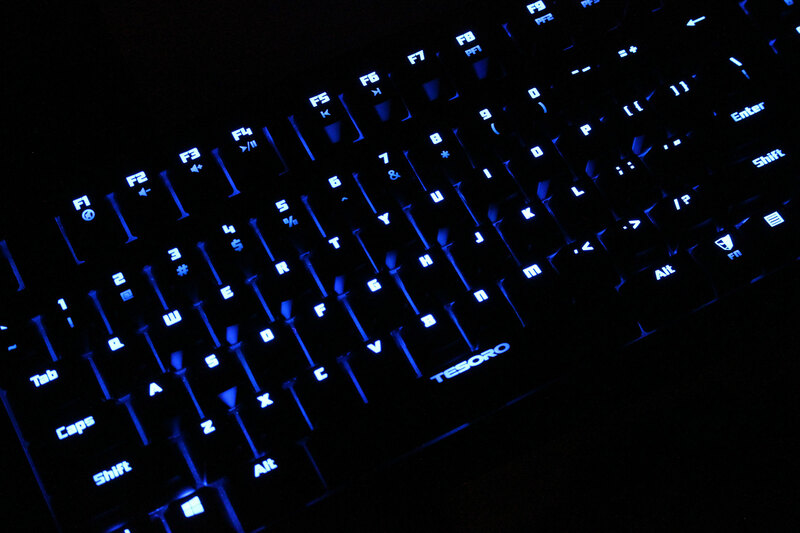 Since those are the most common used for FPS games, it allows easy hand placement when playing in the dark. Plus, another setting allows the top Number keys, Ctrl, Alt, Shift, Caps, and Tab to be lit up as well which can be commonly used for switching weapons in FPS or using different spells/attacks in MMO’s. Two other settings are two brightness levels while the last one goes from bright to dim. The two specific key layouts add functionality to the keyboard given the easy layout when playing. While gaming and writing up reviews with the Excalibur, only a few things set this from being perfect. The size of the keyboard seams a tad small. It’s slightly smaller than my basic Dell keyboard, but a good size given that many gaming keyboards can be pretty big. The simplistic style can be very welcoming to users, seeing as it won’t feel intimidating; granted, there are keyboards designed for specific games. The Excalibur seems more aimed at everyday use with a side of gaming. Besides the customization with macros and programmable buttons, the keyboard also has a few media keys implemented with the use of the Function key that provides quick access to profiles, light settings, N-Key Rollover and USB 6 N-Key Rollover switch, and the media buttons. 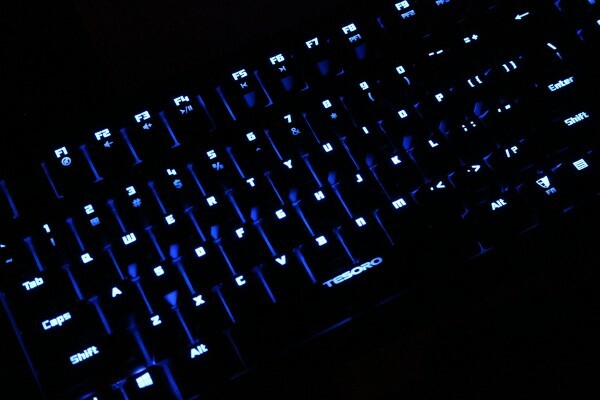 As with some gaming keyboards each has its own key, the added Function key prevents accidental clicks like hitting mute or switching profiles. It replaces the right Windows key and has the Tesoro logo making it easily visible. To get a feel of the keyboard, I decided to play a few games I previously reviewed and spent some time with current games I’m reviewing. It was a blast paying Firefall and the LED lights made it easier to play. Having just a specific set of keys to play really helped while gaming. Seeing as some sessions of Firefall can get hectic, the Excalibur performed really well. Each key responded with each stroke with no lag at all. I wanted to spend a good deal of time before I wrote this review. Since mechanical gaming keyboards are a bit foreign to me, I wanted to feel comfortable typing and using the features it came with. Tesoro did a good job given that the Excalibur is simple yet very effective at what it does. Media keys, light settings, PC/Game modes all within a click of a button. The weight and the structure of the casing make it feel like the Excalibur can take a beating and still function properly. The added LED lights is just icing on the cake with the Excalibur given that it functions well as is. Take that out and you still have a great gaming keyboard. 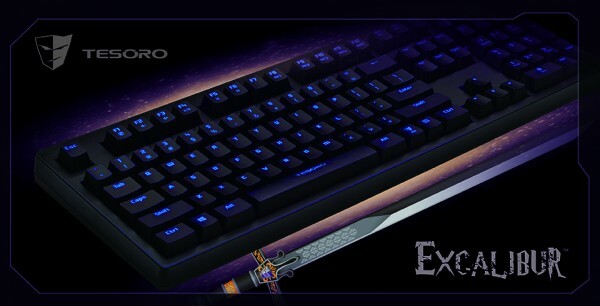 For gamers looking to get a keyboard that does both regular and gaming functions, this one is not to be overlooked. 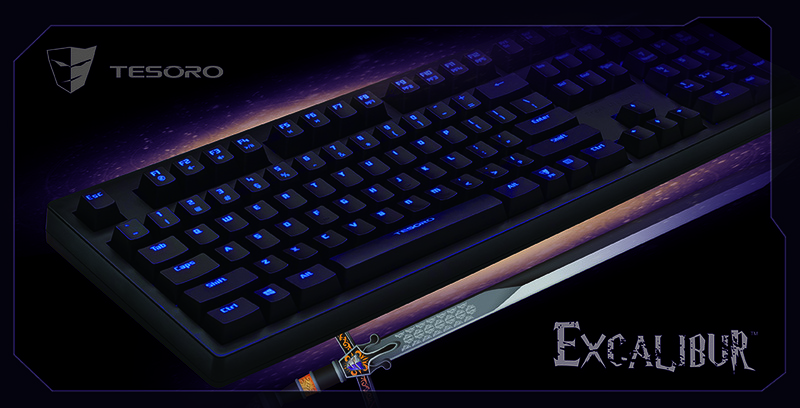 And starting at $89.99, it’s hard not to consider the Excalibur as your next keyboard.